I was craving cookies again while strolling through the Castro hood and decided to roll into Sweet Inspirations as I remembered they did some dipped things. I think I was jonesing for a peanut butter chocolate hybrid but they only had the one choice today so I scooped up the chocolate chip dipped for the small princely sum of $2.65. Not a bad price as you do get a hefty cookie that is thicker than most you'll find around town. It had a lovely golden brown color and nice little crispness around the edges. As you work your way towards the middle it does stay a tad crunchy. Ultimately, one of the issues with thick cookies is the middle can sometimes either be too doughy (underdone) or too crumbly (overdone). This one walked right up to that line and touched a toe over it for me. I do personally prefer a softer, gooey center, something you won't find here. Still it wasn't so bad as it was plentiful with chips in pretty much every bite. And the addition of dipping in a semi-sweet chocolate covering for half gives you an extra jolt of intense flavor. 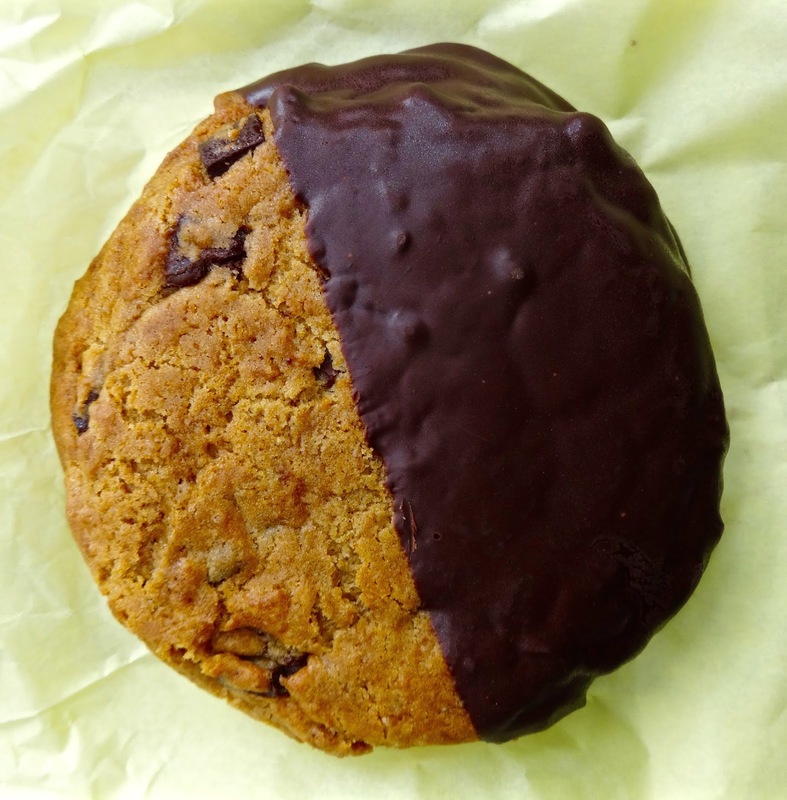 In the grand scheme of cookies in San Francisco it's okay when you consider the price and size of what you are getting. Most basic flavors are here and there is enough chocolate to satisfy that craving. Now if they could just cut the cooking time down a bit and get the soft center it would be right up there in my top five. As is now, it's pretty middle of the pack, but will do in a pinch. It's a quinoa emporium! For all you Financial District workers looking for quick healthy. I'm intrigued mainly because cost will be around $6.95 a bowl. That's cheap SF! It's called Lord Stanley and it's in....the Tenderloin? Okay, why not. So long Chilango after 26 years. Another landlord strikes a blow against taquerias. It's an Uber for wine delivery. Sadly, it's called Doorman when it should be called Drunker. Blue Bottle just got another $70 million funding. Foodie millennials need to find another coffee start-up to call their own. Mama's in North Beach finally got their expansion approval. Remains to be seen if this will create shorter lines. Someone totally loves Kronnerburger and their new brick and mortar location. I just don't want to have to go all the way to Oakland for a really rare burger. Chef Michael Mina will try the whole "pop-up" thing in the Marina. SOMA StrEat Food Park and Off The Grid battle over Mission Bay. OMG! It's like "West Side Story" with food truck gangs! It's the new chef-go-round with local "big name" hires. Castro's high end Mexican spot (an oxymoron?) gets a makeover and way more brunchy stuff because....San Francisco.